This post was contributed by author Columbkill Noonan. 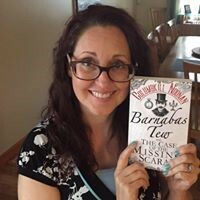 Her cozy mystery, Barnabas Tew and the Case of the Missing Scarab, is currently on tour with Escape with Dollycas into a Good Book. “Errr….” mumbles poor Barnabas. The red has now spread out from his cheeks to color his face entirely, giving him the complexion of a nearly-ripe tomato. It is a most alarming sight, really. “It’s just I’m not certain I’m quite ready,” says Barnabas. “I’m not even properly dressed.” He pats awkwardly at his billowing white robe. (Don’t ask why he’s wearing such a ridiculous thing, please; you’ll only upset him and besides, it will all become clear somewhere smack in the middle of “Barnabas Tew and the Case of the Missing Scarab”, the first book in the series. Poor Barnabas would never forgive me if I spoiled his story!) As for what he wears in the second book, the one that’s coming out in September, well, that’s another story entirely. “It’s just such a surprise!” he sighs. And isn’t that the way of surprises? They can be good, or they can be bad, or they can seem good to one person and bad to another. It doesn’t really matter what the surprise is, it’s how you view it. I personally love surprises. I think the most magical moments in life are unplanned, unforeseen, and therefore, unforgettable. There is beauty in chaos; a field of wildflowers growing every which where, or a rocky seashore with the waves fling themselves wildly upon the cliffs. And there is so much to be learned in the unexpected. Once I was in Frankfurt, all by myself. I don’t speak German (excepting that I can sing all the words to 99 Luftballons, which is, of course, not very useful when one is trying to navigate around a foreign country by oneself. “Hast du etwas zeit fur mich?”is not something one says normally in the course of a day, is it?) Anyway, I decided on an impulse that I wanted to go to Heidelberg, so I walked to the Frankfurt train station (which is enormous) and somehow managed to buy the ticket (I knew the words for train, and which track, and so forth. Unfortunately, I didn’t really know numbers (which are incredibly important when one is looking for a particular train track and there are what seems to be half a billion different tracks), so when the ticket seller told me which track to go to, I was more than a little uncertain. I ran around in circles for a bit, then found what I thought was the right track, that happened to have a train sitting on it pointing in what I thought was probably the right direction. So I got on the train, and sat there…and started to worry. What if it’s the wrong train? What if it doesn’t go to Heidelberg? But then it hit me: so what? I might not be going to Heidelberg, but I am going somewhere, and maybe I’ll like that place too. So I just sat there and happily waited to see where the train would take me. Turns out I went to Heidelberg after all, and it was fabulous, and I loved it, and I kind of wish I lived there now. Barnabas, of course, is a bit more British about things; he likes everything neat and orderly and predictable. He likes to know where he is, and where he is going. He would be most decidedly unhappy to be on a train with a destination unknown. He thinks roses are their most beautiful when they are trimmed and arranged just so, so that each one is in its proper place. He likes for people to behave the way they are supposed to (in a civilized sort of way, that is to say). 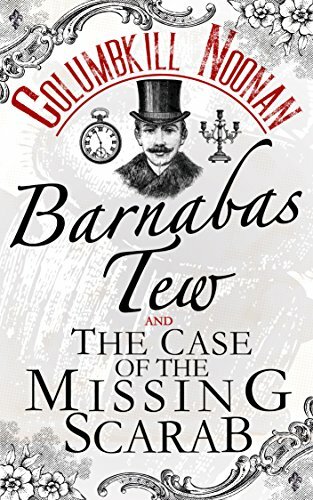 Of course, fiction doesn’t usually behave in an orderly, predictable sort of way, and “Barnabas Tew and the Case of the Missing Scarab” is no exception. Indeed, beginning almost straightaway, Barnabas (together with his loyal assistant Wilfred, who is just a tad more resilient about things) finds himself in the most unexpected and terribly surprising circumstance. To be stolen from a museum in the middle of London and thrust into the very strange (and rather frightening) Egyptian Afterlife is about as unexpected and surprising as it gets. But our Barnabas, distraught though he may be, has a job to do, and he knows that it isn’t terribly polite to let one’s feelings interfere with the discharge of one’s responsibilities. But I’d better stop talking about that, before I give away too much. I don’t want to spoil all the exciting surprises that are in store for the readers! So, back to the topic of surprises and chaos and order. Isn’t life (and fiction) just a wonderful mix of all of these? And, as the Fibonacci sequence shows, wildness and order are not necessarily mutually exclusive. Maybe Barnabas and I are not so different, after all. We are merely looking at the same thing from opposite sides, we are two sides of the same coin, the yin and the yang, yada yada yada. I am excited for the launch date, and can’t wait to see what will come from it, what people I’ll meet, which adventures I’ll have. But when I think about it, I am nervous (just like our dear, earnest Barnabas). People will read the book. I hope that they will like it, but of course not everyone will…nothing is universally liked by every single person on the planet. So, whilst I tend to be a happy, excited sort of person (the kind who loves surprises! ), Barnabas really is a reflection of my more anxious, worrisome side. Really, both sides are required for everything to stay in balance, and to work out the way they should. Sometimes one needs to plan, and sometimes one needs to just go with the flow. So….Surprise! Chaos and order are both necessary, at the same time. “Barnabas Tew and the Case of the Missing Scarab” is now available on Amazon! The sequel, “Barnabas Tew and the Case of the Nine Worlds”, is coming this very September! This is a new author to me. Book sounds like a great read. Glad I helped you discover a new author.